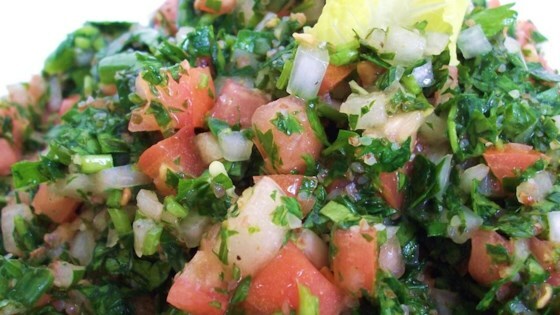 "This tabbouleh is as authentic as you can get! It's a compilation of recipes I've taken from my mother, mother-in-law, grandmother, and various cookbooks. This can be served on romaine lettuce leaves for garnish. Also, I've noticed that this recipe tastes even better the next day, so don't hesitate to make it the day before your guests arrive." Wash and rinse bulgur until runoff water becomes clear. Place prepared bulgur in a large bowl. Add tomatoes to bowl; stir to combine. Allow mixture to sit until bulgur absorbs tomato juice and expands, 30 minutes to 1 hour. Add onion, parsley, mint, and green onions to bowl. Stir to combine. Mix together tomato paste, vegetable oil, and lemon juice in a bowl, stirring until thoroughly combined. Add dressing to salad; mix to coat. Season with salt, ground black pepper, and cayenne pepper to taste. This was amazing. I substituted tahini for the oil and used extra lemon juice. This recipe is so good! One thing...the tomato paste is a must. It adds an extra richness that makes all the difference. I made this tabbouleh for my family. Something was missing, and I can't put my finger on it.